If the title of this week’s photo seems rather unremarkable, it’s because the subject matter depicted in the picture is equally unremarkable. It’s a pair of sunglasses I got at Ross for $11, and behind them you can kind of make out my car keys while the foreground contains a document I had printed off for a meeting. I snapped this picture after I got to work on a recent Thursday morning when the sunlight was just beginning to creep in through my eastward-facing window, which cast a calm yellow glow over everything in my office and pretty much the whole of Stillwater for a few precious minutes. I realized that the stage had been set for a quick photo opportunity, so I grabbed my D7100 + 50mm lens and started clicking away. My first thought was “I need to move those keys!” but then I started thinking about where that would lead, and I didn’t like how it ended up. I thought if I moved the keys around it might create a more pleasing composition. Then I thought I might move the paper a bit. And while I’m at it, I should reposition the sunglasses to catch some more like. And I could shift the entire scene a bit to capture more of the sun’s rays. And the background should probably be changed too…and on and on. I had this little internal debate for about 15 seconds before I shut the whole thing down and just took a few pictures of the scene as-is without changing anything. I realized I didn’t want to create a scene, so much as I wanted to capture a scene. 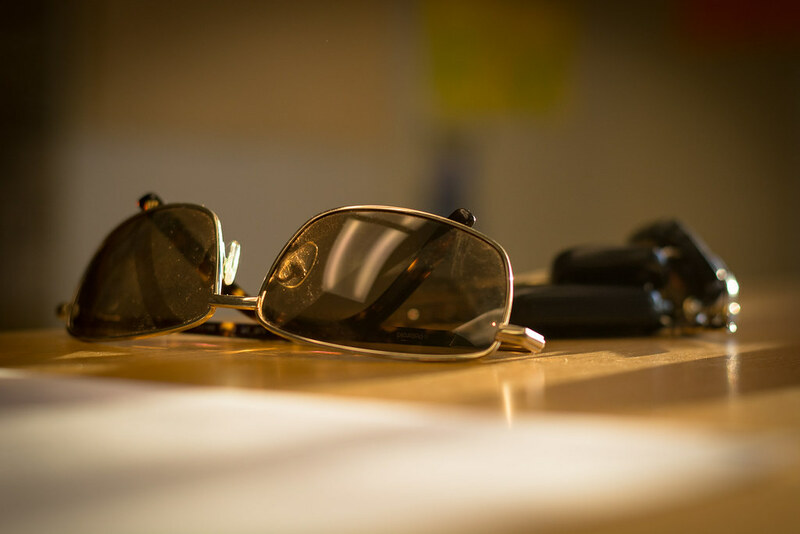 What you’re seeing here is exactly what my desk looked like when I walked through the door and set my keys and sunglasses down, and I think there’s something to be said for photos that capture an image of things as they are as opposed to how we would like them to be. Granted this is just one little example with a few inanimate objects, and one could of course argue (quite correctly) that there is still a great deal of manipulation going on here. I chose to shoot this at f/2.8 in order to get a shallow depth of field. I chose to have the foremost nose guard in focus. I chose to shoot from a low angle, a short distance away, in order to get one particular perspective. I even chose to edit the picture in Lightroom and make a few tweaks to the white balance and other settings. And if I’m being entirely honest I did actually move a couple of miscellaneous office trinkets (I think one was a binder clip, perhaps) out of the way so as to not clutter the frame. What you have, then, is an artificial construct that represents an organic scene. In one sense nothing was manipulated, and what you see here is as it was. But in another sense, lots of things were manipulated and what you’re seeing here is not at all like how things actually were. But that’s the beauty of photography and indeed all art: it is what you want, and others can interpret it however they see fit. Really like this shot! Love the simplicity. Interesting–my first thought was you had just gotten home from work, ready to relax. Instead, you are charged up, ready to go. I like this shot also. Photographers see how light provides for a nice photo of very ordinary things. It’s the awareness and the perception that make it more than just a snapshot. You are fortunate to have a window in your office. I could not take a picture of my desk, there would be too much distracting clutter. Simon, this is just the type of conversations I try to urge my students to have with themselves. I even give them a list of questions to think about each time the go to shoot. 1-What do I need and is it prepared? 2-What is the light? 3-What is my perspective? 4-Do I want to convey depth of field or action? If I get to the point of teaching a Photo 2 class, I will add composition questions to the list. I’m hoping, as they practice, that this is a 15 second conversation in their heads that result in a wonderful image like this. Thanks again for putting your thought process into words. And thank YOU for all you are doing to teach thought processes like this to other photographers Rebecca! It seems like a lot to do all at once when you’re just trying to snap a photo, but you’re exactly right in that asking those questions can lead to much better end products. And a lot of it really does become second nature over time. Keep up the good work! Thank you again for a great and inspiring article. Towards the end, you point out something that a lot of photographers do or try to do, myself included…create a picture rather than capture a scene. On a cruise to Alaska last year, I did most of my shooting from the balcony of our cabin, so there wasn’t much room for change. I was limited to the different angles due to the movement of the ship in realation to the subject I was photographing. It turned out to be a fantastic lesson in “do the best you can with what you are given,” and overall, I am very pleased with the results I got. One of the shots, a simple finger of land sticking out into the water against a sunset, has been enlarged into a canvas gallery wrap that’s going up in the livingroom of the house we recently bought and moved into. It gives me a great feeling of pride and accomplishment to know that other people will see it and enjoy it. I realized that it was the best I could do with what I was given as far as side angle, and elevation from where the shot was taken. I’ve often thought “what if” I had been lower on the ship, or if I could have been more to the bow or stern of the ship when I took it, and realize that it’s pretty good just as it is.